(4) 2Pk Car Mount Magnetic Air Vent Stand Phone Holder iPhone 7 Plus 6S 6 5S Black (8 totals). 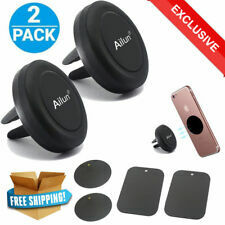 2Pk Car Mount Magnetic Air Vent Stand Phone Holder iPhone 7 Plus 6S 6 5S Black. STURDY BASE: The high-quality rubber construction of the base of the mount is unique and very functional as well. 2Pk Car Mount Magnetic Air Vent Stand Phone Holder iPhone 7 Plus 6S 6 5S Black. STURDY BASE: The high-quality rubber construction of the base of the mount is unique and very functional as well. · STURDY BASE: The high-quality rubber construction of the base of the mount is unique and very functional as well.